What is worth doing; is worth doing stonkingly well. 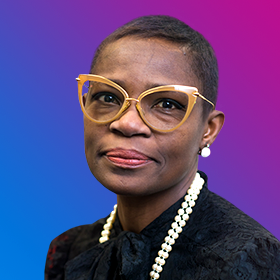 Yinka oversees the day-to-day running of the Volans office as well as acting as Executive Assistant to John Elkington and Louise Kjellerup Roper. 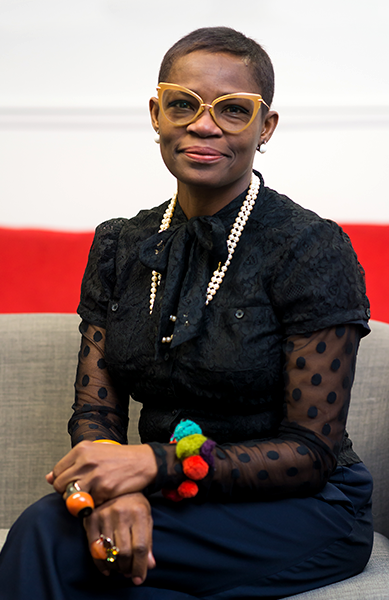 With a career that has seen her work as an assistant to architect Zaha Hadid, raise two children and train as a professional milliner, Yinka knows how to run a tight ship with flair and patience. She describes her typical day as intense and fun. Her eye for detail and ability to juggle many balls at once is perhaps best displayed in the company events she organises, such as Volans’ 10th anniversary celebration at the Wellcome Collection. In addition, her meticulous project management saw Volans’ successful relocation to Somerset House at the beginning of this year. She is passionate about Art, Design, Architecture, Antiques, Fashion and Textiles. She lives in London with her husband and two teenage daughters. A. Sheer compulsion and a heavy dose of interest. A. Not fully awake yet; but no longer asleep. A. A bit of all three really. My left side is the past; right side present. My core: the future. A. Eyesight. High level eye-care for all; especially in the developing countries. A. My eyes: that I can look and ‘see’.